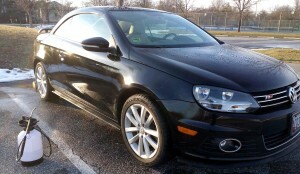 Three years ago before Trump became President, we shared the 35-min rinseless car wash guide to our private Volkswagen Eos community and it quickly spreaded to other car enthusiast forums; it’s earned really great feedback from a lot of people and we also learned a lot along the way. 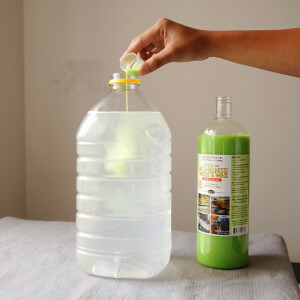 Due to the fact that rinseless wash is a very niche idea, it’s mostly useful to just folks who have limited access to a garden hose or got a restricted water supply –but this technique has proven beneficial to all others as well. Rinseless wash, or water-less wash, consumes just about 32 oz of water and takes less than an hour to finish –if you also do waxing. It is ideal for anyone who wants a quick clean up for your car that gets the job done without ton of preps effort. 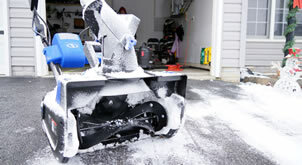 On other side of the coin, we have folks who isn’t in the drought zone and could do two-bucket method or pressure washing the harsh winter salt off your car anytime you like; or those who got your own house and isn’t bothered by the landlord everytime simply by washing your car in the parking lot –you’re fortunate. It has to be quick, especially in cold weather. We don’t want to stay out in the frozen temperature for more than half an hour. Doing rinseless-washing/two-bucket wash on a big truck or RV home could take an hour or more. It might be a pleasure to do in fresh spring or under the summer breeze, but sub 30°? No freaking way. I’d rather Netflix and sleep away. Does not consume a lot of water. Two bucket method easily uses more than 8 gallon of water every time. 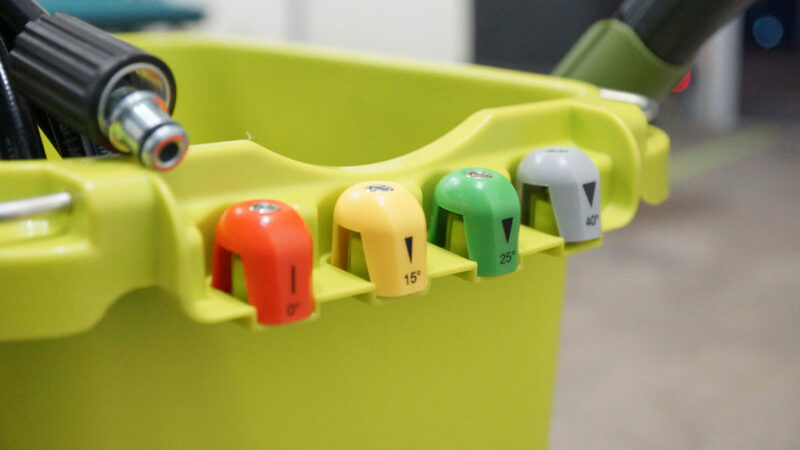 Does not require a cart full of different cleaning bottles and tools. Has the safe power to make the job easy and able to blast off the winter salt/road grimes without too much human effort and without causing bodily injury or property damage. All these requirements simply point to pressure washing. But if it’s winter, aint nobody got time to bring out the icing water hose, run it to the drive way, then go buy the gas or run another cord for power just to wash a car! By the time I finished all this preparation, you probably have completed season 7 of GoT. Also what if we don’t even have a garden hose (apartment, RV) then pressure washer is certainly a no-go. 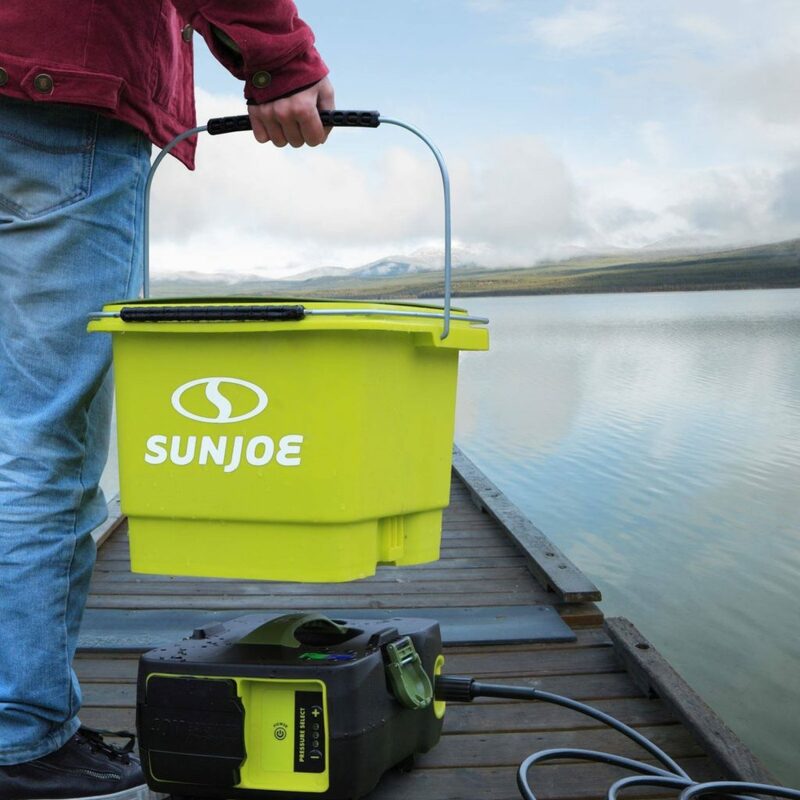 So with all these conflicting reasons, you’d know why I have been so highly intrigued when Sun Joe introduced the Lithium-ION battery-powered pressure washer with its own water supply container last years. I finally got my hands on the SPX6000C-XR after many busy months reviewing PC tech and summer hibernation. So let’s take a look! The packet arrived from Amazon a bit all beat up. Thanks, Kim! The box looks a little smaller than I thought. But I soon find out most accessories, including the base unit fit neatly inside the 5-gallon bucket. 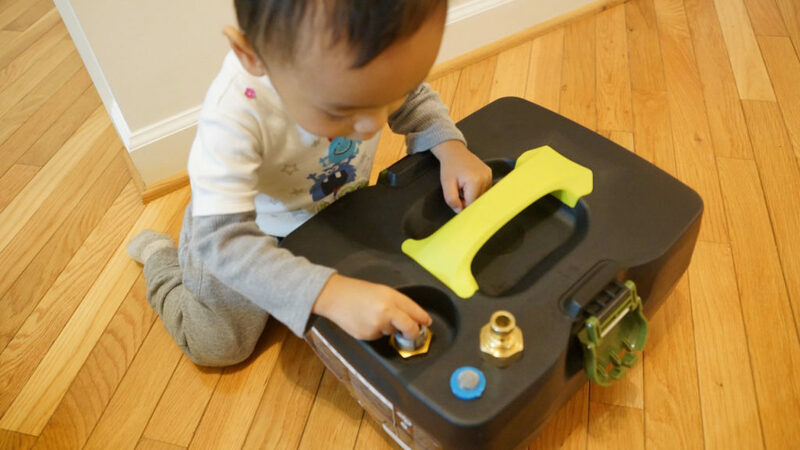 This little machine runs on 40V battery, uses the water supply from its own water container that sits on the top. It can also take the garden hose in place of the bucket, if needed. 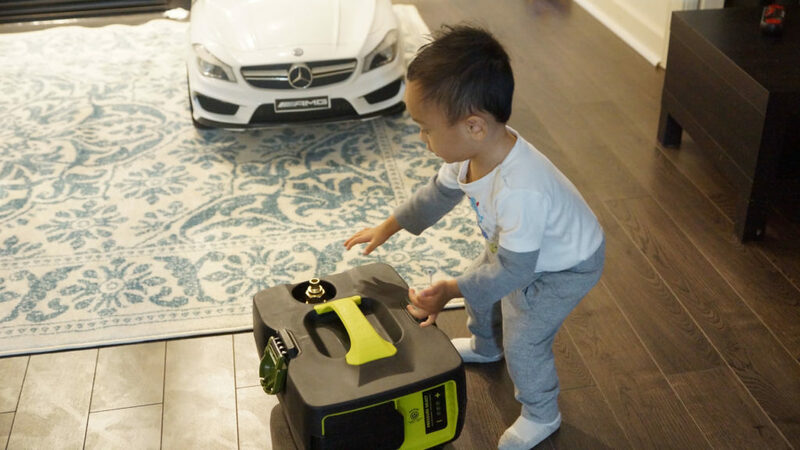 At the pressure rating of 1160 PSI, it’s got enough power for many light-duty cleanings around the home. In our case, it’ll be used to wash off salt and clean up the car during cold season. Disclaimer: you may start to quite enjoy it in the summer too. But a rinseless wash is still the best wash for your car. 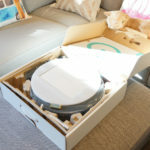 After a haste unboxing and several pretty severe paper cuts, from the right to left in the photo below, we have the base unit that houses the brushless 600W motor, a green 5-gallon bucket with manuals. 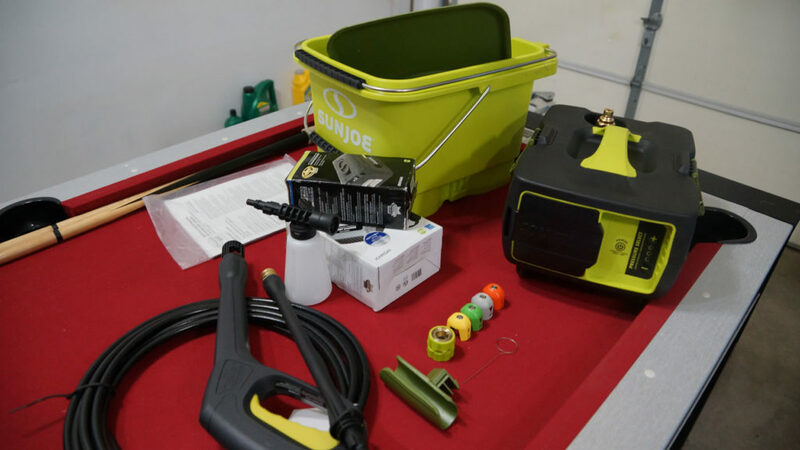 Toward the front, you should see the EcoSharp battery and charger, soap dispenser attachment, trigger gun and spray wand, high-pressure water hose, gun holder, needle clean-out tool and last of all, four quick-connect nozzles that spray at 0°, 15°, 25° and 40° angle. The whole she-bang. Doesn’t come with the pool table though. I notice the trigger gun is attached with a warning note that says DON’T POINT THE NOZZLE AT ANYONE, the high pressure water could hurt them tremendously. I immediately did the opposite to myself as an experiment later, and totally regretted it. 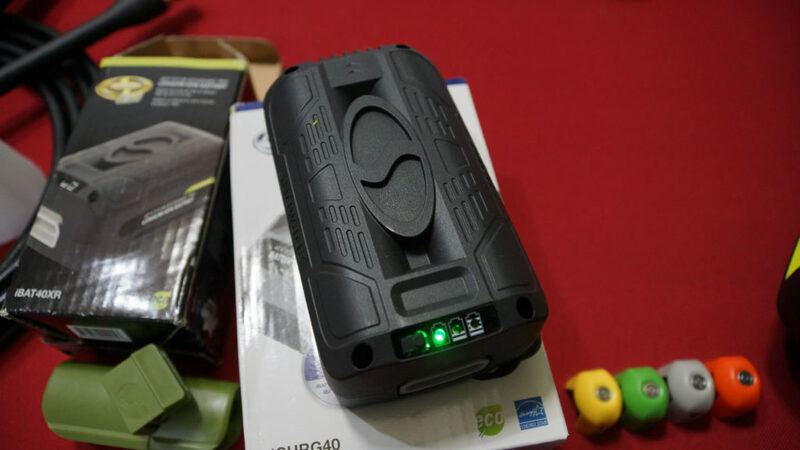 Below is the photo of the Lithium-ION 40V 5.0Ah battery –not Lithium, because Lithium alone is not rechargeable hence Lithium-ION. 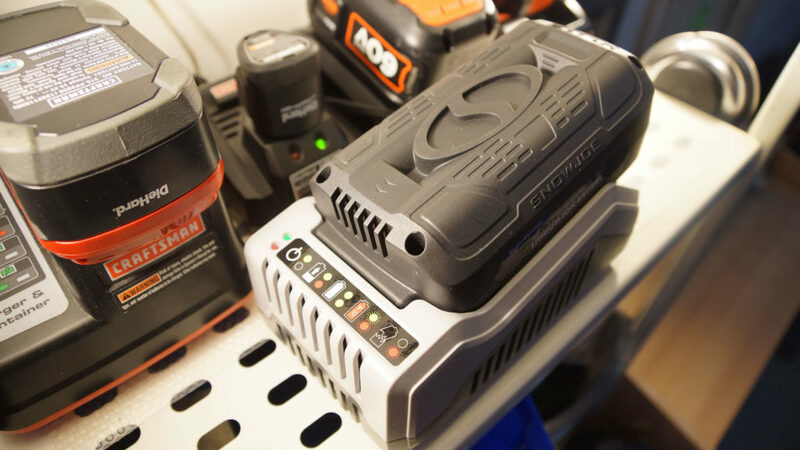 Most of my older tools use 18V or 24V battery so seeing the bragging 40V, I expect it to have some power. My Black and Decker 60V CM2060C Lithium-ION lawn mower has been great so far. I hope this does not disappoint. I like the fact that the bucket has storage locations for all four nozzles which makes changing them a breeze. 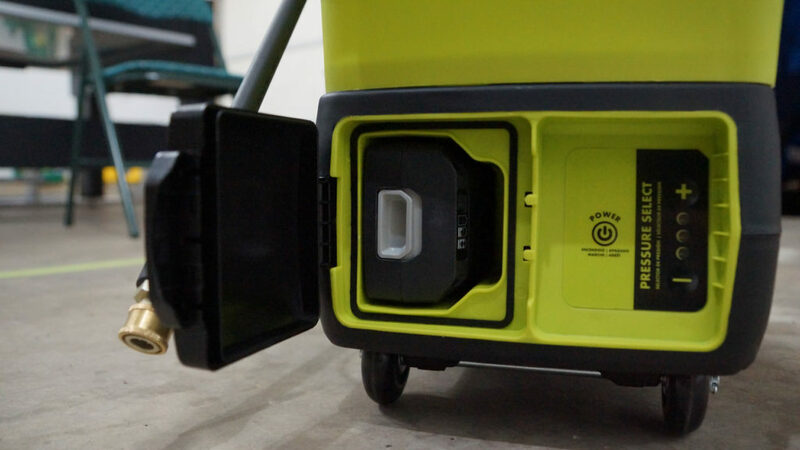 The whole machine is very compact and easy to move around with all-direction wheels at the bottom of the base. What is the function of each nozzle? Red nozzle: used to dissolve stubborn substances, cake muds, undersides of lawn mower and tractors, etc..avoid using this on the car paint. 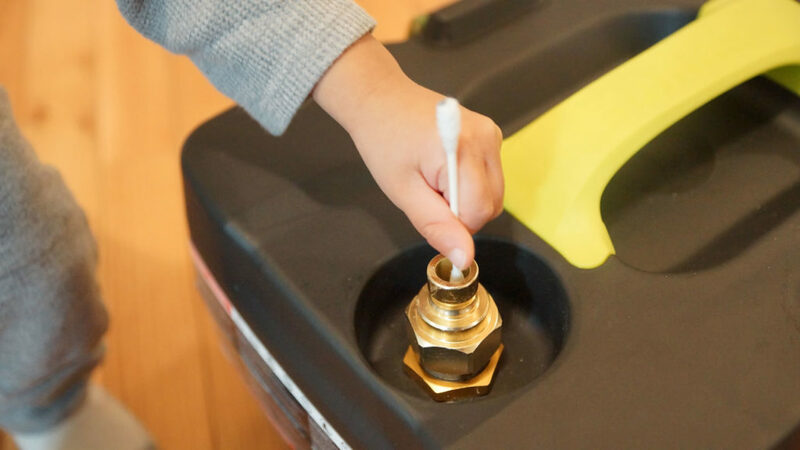 Yellow nozzle: intense cleaning jobs on hard surfaces; eg. stripping paint, oil stains, grease, mildew and rust. Green nozzle: clean home siding, brick patios, wood decks, driveways or sidewalks. Gray nozzle: clean cars, trucks, boats, furniture, or lawn equipments. Battery compartment is behind the front cover and should repel all water intrusion. Unless you really try to shower it like I did. Fortunately, still no water could get in between the battery and base’s electrical contacts because the tunnel is very deep. —what he said. 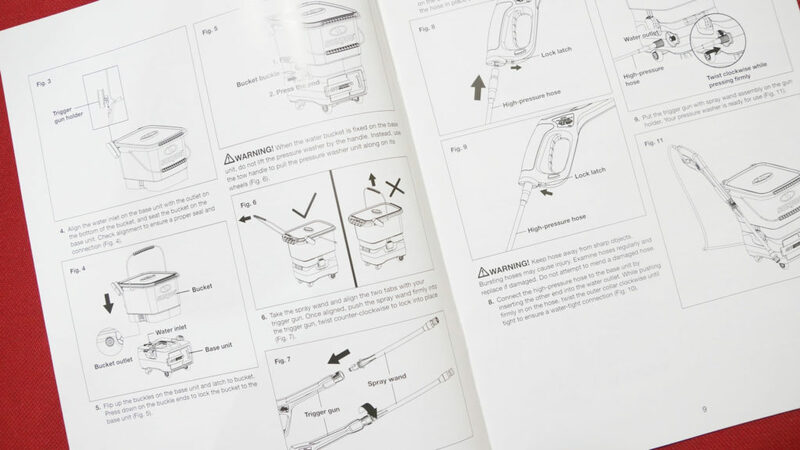 There are many useful advice found in the manual, here I list a few things for your infos. 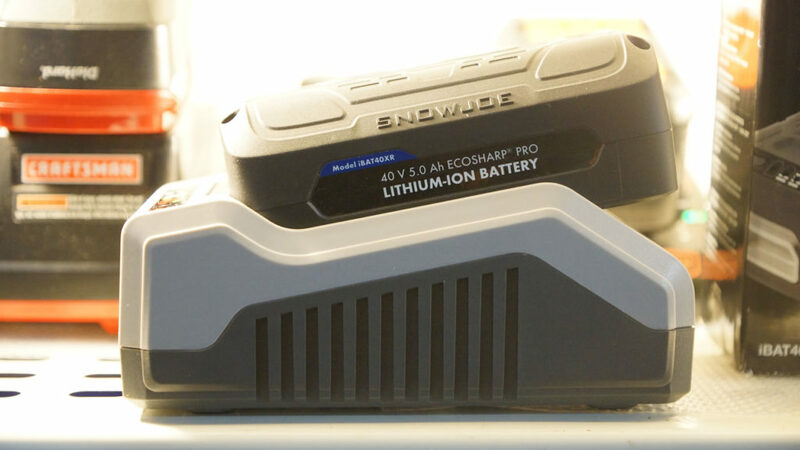 It takes about 3 hours to fully charge the EcoSharp 40V 5.0Ah battery of the Sun Joe SPX6000C-XR. Continuous run time rated between 19 to 31 minutes according to the manual. In my case, I finished a whole 5-gallon bucket with full bar of battery left, pressure set at medium & start and stop triggers. So that’s something. 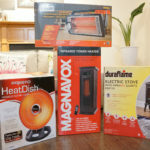 Also do not use hot water –max temp. 104°F/40°C. Warm water is ok.
Based on my usage, I’ll expect the machine to run a little more than one hour (2-3 five-gallon buckets) at the very least. 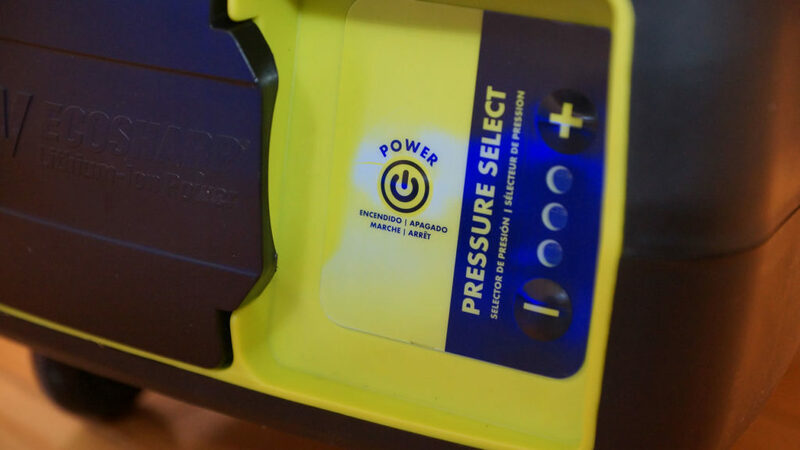 However, applying max pressure setting and continuous trigger you’d probably meet the manufacturer’s expected runtime sooner than later; which is less than 30 minutes. 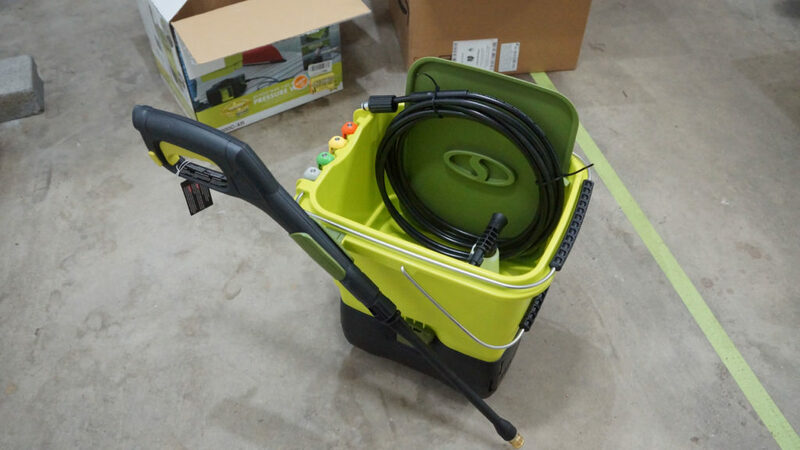 The pressure washer weights about 20lbs with battery installed and the bucket can hold up to 5.3 gallon precisely. 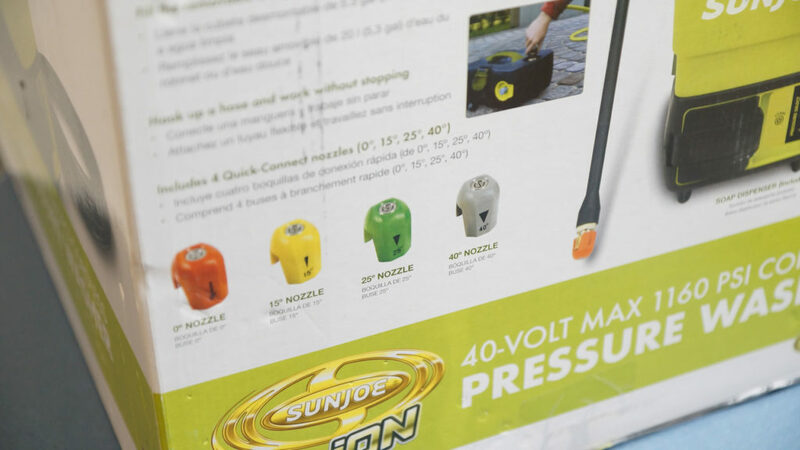 You may find the pressure settings are rated at Low (507 PSI – 0.66 GPM), Medium (650 PSI – 0.75 GPM), High (800 PSI – 0.79) and wonder how Sun Joe advertises this thing can shot water up to 1160 PSI. 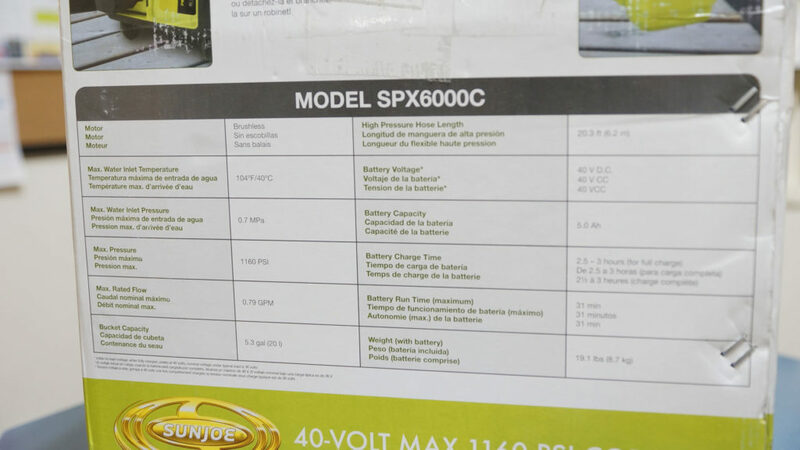 In this 3-min short video, I quickly demonstrate how the Sun Joe SPX6000C-XR works. Water pressure is safely set at 650 PSI and 25° nozzle was used in conjunction to avoid any paint damage. This combination generates a soft, yet much stronger than a shower stream to lift off dirt, road grimes and winter salt. The manufacturer recommends 40° gray nozzle to clean car, but if you find it not strong enough at medium pressure setting then use the combination I have shown. You can crank up the pressure setting to High and use the same gray nozzle, but you will sacrifice runtime for the same result. Applying max 800 PSI and 0° nozzle for paint is absolutely not recommended, it’s best to use for cleaning wheels and under carriage only. Even so, proceed with care. 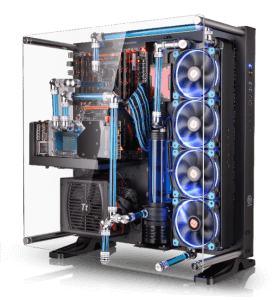 Uses little water (0.66 GPM to 0.79 GPM). During my wash, I only used 3.5 gallons of water. Now that’s a lot more than 32 oz rinseless wash, but note that I mostly spent the extra time for the camera. A conservative, effective wash should consume just a shy of 2 gallons of water or less. Accepts water supply from either bucket or garden hose. If you dislike water spot, be fancy and use distilled water. Has good power. Not as strong as a gas-powered pressure washer (ofc) but it’ll serve you very well. 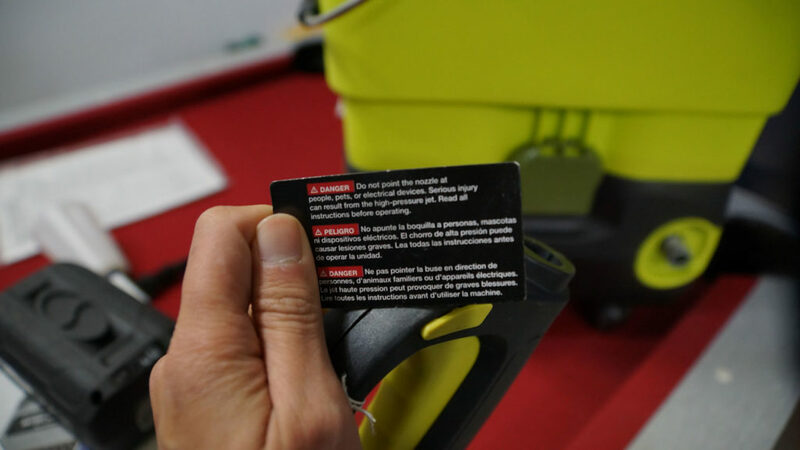 You may even use the other machine less often, when having this one since the pressure is safer. Fast charge, battery runs long enough under medium pressure setting. 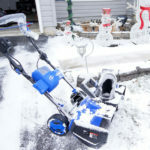 Can tackle siding, patio, driveway cleaning jobs. Small bottom base unit, large top bucket = the whole thing may tip over, especially on slightly steep driveway. Would love to have a compartment for the water hose. Would love to have locking mechanism for wheels to prevent rolling. Soap dispenser attachment is a disappointment. Though it does the job, the pressure is weak and unable to reach very far. There is a water filter by the inlet of the SPX6000C-XR base unit. 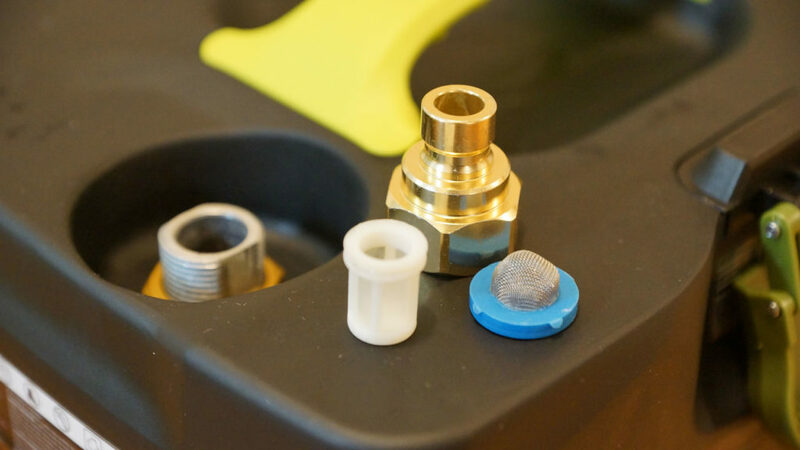 Turn the hex nut counter-clockwise and you should be able to get the three parts of the filter out for cleaning. Be sure to clean the inlet too. Putting them all back is very easy, even a one-year old could do it. I think. Some of them may try to swallow everything though, so keep an eye! Once done, store away your washer. 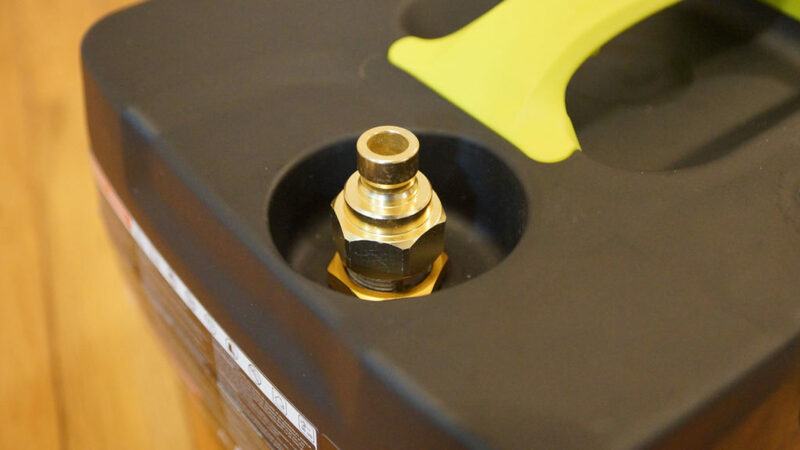 If the location temperature falls below 32°F (0°C) then make sure you drain all the water from the base, disconnect the hose and apply anti-freeze if it’ll sit for a long time. 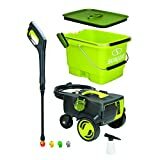 I grow to enjoy washing more stuffs around the house with the SPX6000C-XR, since now I don’t have to carry a gas tank, power cable or a garden hose around with me anymore. The 5.3-gallon bucket is plenty. It should last you a good area before you need to replenish. Big wash job probably requires you to connect a garden hose again just to save the trips. Unless you’re Arnold. The only thing I have to complain about is the structural design of this pressure washer. Like I mentioned earlier, it’s small on the bottom and big toward the top which makes maneuvering the unit quite difficult. It has the tendency to fall over small bump, gravel, rock, thick grass, dead squirrel or anything physical in its way. I also found the Sun Joe SPX6000C-XR tried to run away from me couple of times on my slightly steep driveway. Other than that, it’s a great product. Pricey, but great. Find an used one on Amazon, it’s usually half the price! 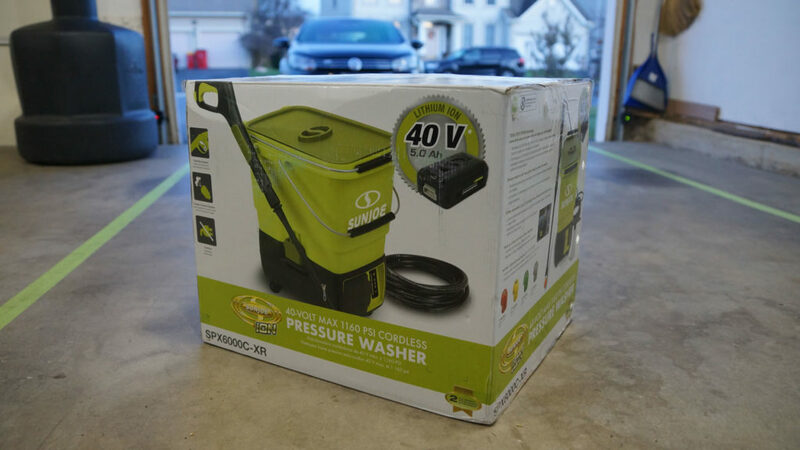 Sun Joe recently released the newer version of this pressure washer, the SPX6001C-XR. An updated review is coming soon! 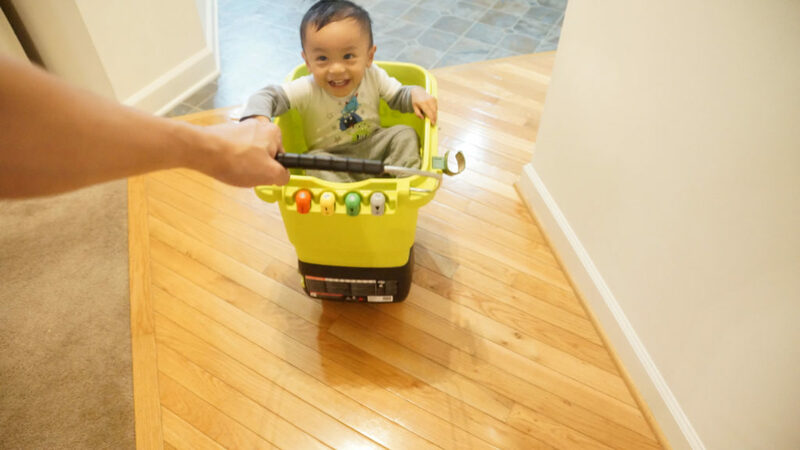 Perfect for multi-tasking cleaning. 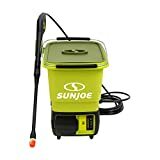 This is not a pressure washer but a power washer. Watch the power settings .. will still remove mold and finishes on oputdoor wood rocking charis. Washing the car for me is always a challenge.